A great Grand Canyon vacation starts with some budget travel tips that fall into the category of practical advice about your surroundings. One of the most common mistakes visitors make in the Grand Canyon is a failure to account for the fact that the rims of the Grand Canyon are much like standing on the summit of a tall mountain. Elevations along the rims can rise to more than 8,000 feet above sea level. Don't fall prey to altitude sickness. Pick up some bottled water, even in months when heat is not an issue. Speaking of temperature, don't associate the Grand Canyon with year-round heat. It can be cold and snowy in winter, and roads along the rim can be blocked during the winter months. Don't waste money traveling to sections that are closed or clogged with snowbound tourists. Ask for current road conditions when visiting in winter. Finally, plan your lodging for the night, even if you're one of those budget travelers who likes to roll without reservations. Lodging options operating within the national park often are reserved many months in advance. Reasonably priced rooms can be found within 100 miles of the South and North rims. Check Flagstaff, Ariz. or Kanab, Utah. The view you see here was taken on the edge of the Grand Canyon, fairly far removed from the South Rim viewing area. Thus, it is not the standard shot you see of this natural wonder. There's a reason the South Rim is so popular--the views are unforgettable. But you should also consider a trip to the less-visited North Rim or perhaps Grand Canyon West (more on that is just ahead). Everything from meals to lodge reservations to budget rooms outside the park can be acquired more easily from the North Rim. Unfortunately, many of us only have time to visit one vantage point. It's a geographical issue. Although separated by just 15 miles as the crow flies, the driving distance around the canyon between North and South rim views is nearly 280 miles! Much of that long distance is on roads built for sightseeing, not speed. Planning far in advance is necessary for anyone who wants to raft the Colorado River within the Grand Canyon. It's an experience many visitors dream of, but sometimes they show up with unrealistic expectations. Rafting the Colorado within the Grand Canyon usually is not possible in a simple day trip. 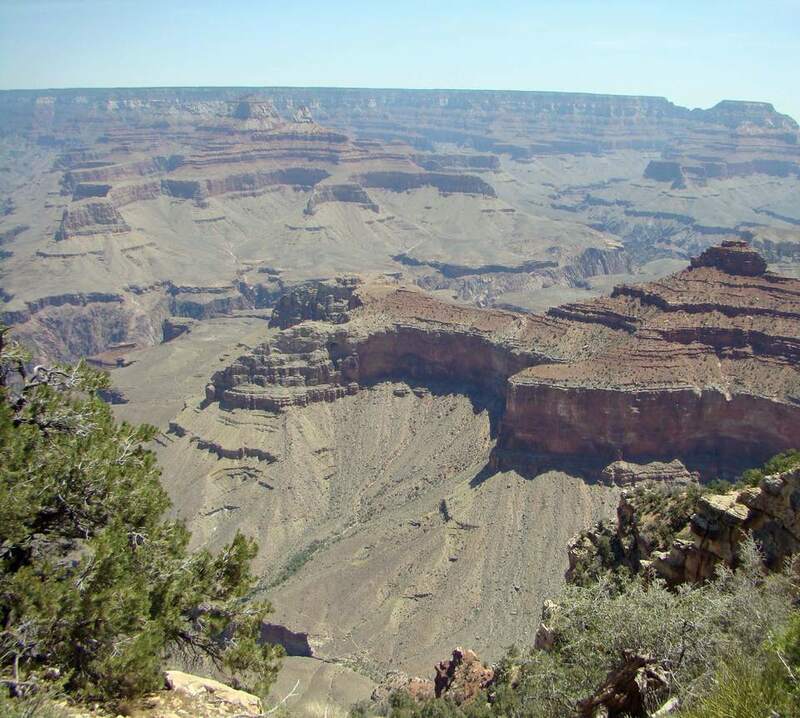 Two- to five-day trips leave from Diamond Creek in Grand Canyon West. Most other trips of this type involve a minimum three-day commitment. They are offered by a variety of park-approved vendors. For a less expensive Colorado River alternative, consider a rafting trip between Glen Canyon Dam and Lees Ferry, leaving from Page, Ariz., about 140 miles from the South Rim entrance. Although not within the Grand Canyon, the Glen Canyon experience from Colorado River Discovery is scenic and can be done in a half-day. Skywalk provides a unique opportunity: you'll venture out across an observation area with clear decking, allowing the illusion that you're walking on air about 4,000 feet above the canyon floor. There are two issues you should understand right away about this experience. The first is that it is expensive, and the second is that you'll spend time and effort in addition to money to reach the area. The Skywalk is on lands owned by the Hualapai Tribe. You'll pay about $88/person, some of which is for admission to Grand Canyon West; the other half pays for access to Skywalk itself. Grand Canyon West is near Kingman, Ariz., which is fairly far from where most tourists view the canyon. It's good to know the tribe benefits from the revenue, and there is nothing wrong with taking a detour for a new perspective--just realize it will involve extra expense, planning and time. Check out detailed information about Skywalk. Don't expect to see a "restaurant with a view" every few miles along Desert View Drive, the spectacular 25-mile scenic route between the South Rim parking area and East Entrance. There are places to pull over and enjoy a picnic lunch or dinner. It will be a memorable experience if weather permits. You can buy provisions in a number of places, but the closest town to the South Rim is Tusayan, which also has fast-food options that could save some money. If a picnic or a cheap lunch isn't what you want, consider making dining reservations in one of the Grand Canyon National Park lodges. Although not really a budget option, these meals are packed with value because of the views you'll enjoy and the memories you'll take with you after the meal. It's worth considering as a budget travel splurge. The Grand Canyon is famous for its mule teams that transport tourists to the floor from the rims on narrow, steep trails. But many other adventurers arrive wanting to hike, and they're greeted with ominous warnings. Many of these folks--even those with a lot of hiking experience--ignore the warnings and suffer sometimes dire consequences. One of the biggest causes of injury and even death here is the temptation to begin hiking into the canyon along what seems to be an easy trail. Walking down the trail without proper provisions or enough remaining sunlight is extremely dangerous, especially in Summer, when temperatures routinely reach 105F near the canyon floor. If you are determined to hike, be certain you have the proper equipment and the necessary fitness and experience. Consider going with a guided group. Two key rules that good hikers follow: allow twice as much time to come back up as it took to go down. That means only about a third of your time will be spent ascending, while the other two-thirds will be for climbing. Also, don't huff and puff. If you can't talk comfortably while walking, your body is not getting enough oxygen. Slow the pace. The busy season here is Summer, when families trek from thousands of miles away to enjoy one of America's greatest natural wonders. Lodge rooms and campsites can be booked many months in advance, so don't expect to snag last-minute park accommodations, especially near the South Rim entrance. That entrance is open every day of the year, but some facilities and roads can close in Winter. Many can't avoid the summer crowds, but if you have any flexibility in your travel schedule, consider coming in another season. This could save money, because hotels in the region might offer bargains to fill empty rooms. But a more certain benefit of off-season travel here is value. You'll gain much more from the experience when you don't have to deal with crowds and distractions. When you visit Las Vegas on a budget, you will see plenty of tour operators offering trips to the Grand Canyon. You'll also hear that it's possible to complete a visit to the Grand Canyon in a day-trip from Las Vegas. Be skeptical as you approach both of these concepts. The tours from Las Vegas are sometimes overpriced. The Las Vegas-based helicopter tours of the Grand Canyon usually start at about $250/person, but they do afford some time at your destination and you're likely to get some spectacular pictures. By contrast, if you go on a bus tour or drive your own vehicle, keep in mind it is nearly a 600-mile round trip. That's a lot of driving in one day for relatively little time at the canyon. It might be possible, but it's definitely not the best way to go. Zion National Park in nearby Utah is a good place to visit in connection with your Grand Canyon experience. If you can work this spectacular park into your itinerary, your trip will gain value. When visiting multiple national parks, it pays to consider an annual pass for $80 USD. Admission to Zion without the pass is $25 for a vehicle, and it is good for seven days. Go to the Visitor Center, park your vehicle and hop aboard the free shuttle service. It runs between April-November and helps relieve air pollution and traffic congestion in the park. Stellar hiking and camping opportunities can be found here, and it's only about 145 miles from the North Rim entrance of the Grand Canyon to Zion. Another nice excursion from the Grand Canyon is the picturesque town of Sedona, about 110 miles south of the South Rim entrance. Okay, so "nearby" in the great expanses of the American West might not fit the definition of that word in your neighborhood. No matter. Proximity to natural wonders will allow you to forget distance and concentrate on beauty. Horseshoe Bend, as you see in the picture, is a scenic turn in the Colorado River near Page, Ariz., about 130 miles from the South Rim entrance. It takes an investment of time to get here, but it's well worth it. You'll hike about a mile to the overlook, which does not have any guard rails. Take small children firmly by the hand. Once you've enjoyed the view, there are restaurants and budget hotels in Page, which is near the midway driving point between the North and South rims.